The MEC line of Impulse Foot Sealers are ideal for sealing large heavy bags. By having a foot control, the hands are free to feed the machine. It is like having an extra hand. Units come complete with pedestal, stand, adjustable working table and adjustable foot control. 2mm, 5mm element wires are available. Optional Hot Stamp Imprinter. 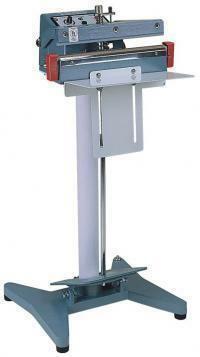 The AIE line of heavy duty Impulse Foot Sealers (FI series), are specially manufactured to increase sealing production. Equipped with foot pedal activator, the user's hands are free to feed the machine.